Forgive me for not having wonderful pictures for this one, but it has quickly become one of my favorites! My husband loves milkshakes, so this is a healthier alternative when we are in the mood for a shake. Sometimes I have it for breakfast - since technically it is a protein shake. I adapted this recipe from Whole Foods New Body. Peel & slice the fruit before freezing (I leave the peel on the peach - you'll want to peel it before freezing if it bothers you). 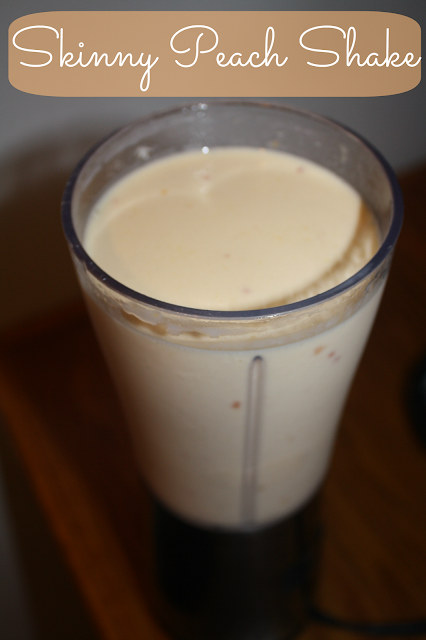 Combine all the ingredients in a blender and pulse until milkshake consistency. You can use fresh fruit, but you'll want to add 8-10 cubes of ice. It won't be quite as thick. You could always add some fat free vanilla greek yogurt to make it creamer, but the frozen fruit really helps to make it thick. I altered mine so it is only 182 calories! Talk about guilt free! You can always add more or less fruit, protein powder, & almond milk to suit your taste.